I had packed a checked bag, a shoulder bag full of his needs and my favorite leather book bag with my electronics. Donovan was safely in his car seat, and we were all set. My husband dropped us off at Hartsfield-Jackson International Airport. I placed the baby on me in his carrier, checked my largest bag at the curbside check-in, and moved through security pretty smoothly. The gate agent announced our flight would be delayed because it was being repaired. I’ve always wondered why the airport staff tells passengers stuff like that. It’s not comforting knowing your plane isn’t working just before you’re set to get on it. But I otherwise wasn’t very bothered. 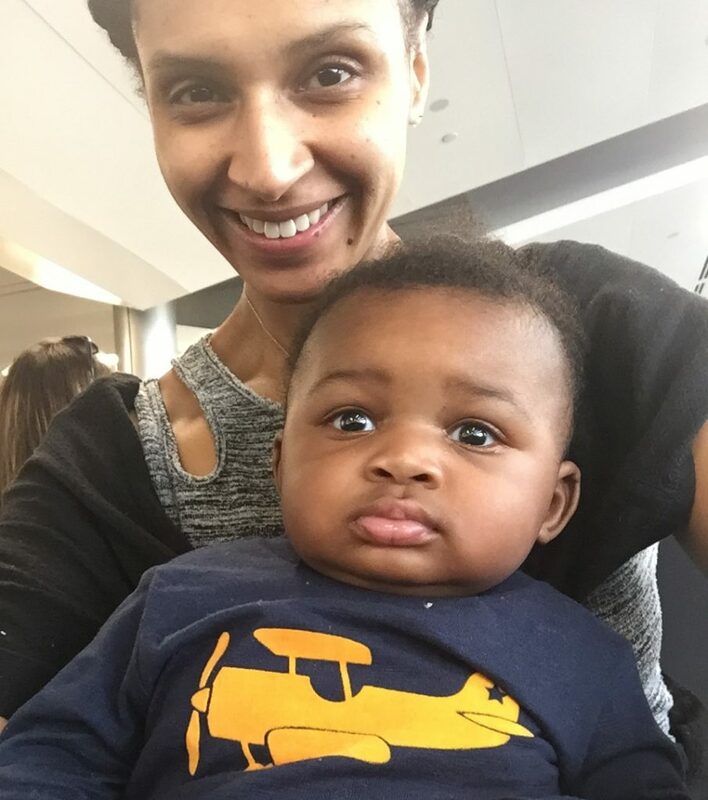 I fed Donovan, got a sandwich for myself then decided to use the extra time to change his diaper and let him gaze out of the airport windows. He loves taking in new sights and sounds. I was genuinely excited. There is something about exploring the everyday occurrences with a child that gives you permission to experience it just like they are – for the first time. I take it all in: the setting sun, bags being loaded onto one aircraft and another gliding to its gate. Then, I figured we should make our way back to our gate. That’s when I noticed people hurrying off and quickly gathering their things. I asked the gate agent for an update. The good news was the plane repairs were finished. The bad news was the plane arrived at the wrong gate, which forced the patient travelers and I to walk across a section of the airport. At one point, I passed one those large golf carts used to take passengers from spot to spot. Something told me hop on. Instead, I told myself that wasn’t for me. It was for the elderly and those with disabilities. That’s when Donovan spit up his milk as if to say enough is enough. I stepped to the side, cleaned him up and continued walking. When we finally got to our new gate, it was just before the gate agent announced it was time for those with children to board. I rushed to the front of the line, took out my cell phone and it did what technology often does at moments like this – it failed me. The boarding pass I opted to have text messaged to my phone refused to load. That was the last straw. “This is bull****,” I said then took a breath. I stepped out of line, took a seat and waited for my phone to collect itself. Just as the final boarding group was lining up, my boarding pass loaded. It was a small victory but a fulfilling one. When we finally got on the plane, I was too exhausted to be embarrassed that Donovan was now crying. I just took our seat, gave him his pacifier and rubbed his head until he fell asleep. We were finally on our way to Chicago.